Time is relative, so they say. Bandung, the capital of West Java, Indonesia, seems to exist in two dimensions of time, parallel universes. The modern, polluted, busy, overcrowded industrial city with a sprawling urban population of over eight million inhabitants – Here, the main attractions for plane loads of local and international tourists are the numerous clothing factory outlets. If you own any clothing “Made in Indonesia”, that most likely means, “Made in Bandung”. There are more than three hundred textile industries here. Bandung is also home to hundreds of pharmaceutical factories, as well as a high-tech aircraft industry, and numerous universities. Then there is the other Bandung, the place that time has forgotten. A place of nostalgia, a living museum. Braga Street, the heart of this time capsule, is the place which historically gave Bandung the pseudonym “Paris van Java”, “The Paris of the East”. During the Dutch colonial era, this was the meeting point of the colonial plantation owners and workers. Barga Street was lined with high society shops, theatres, cafes and nightclubs. Even Charlie Chaplin performed here. 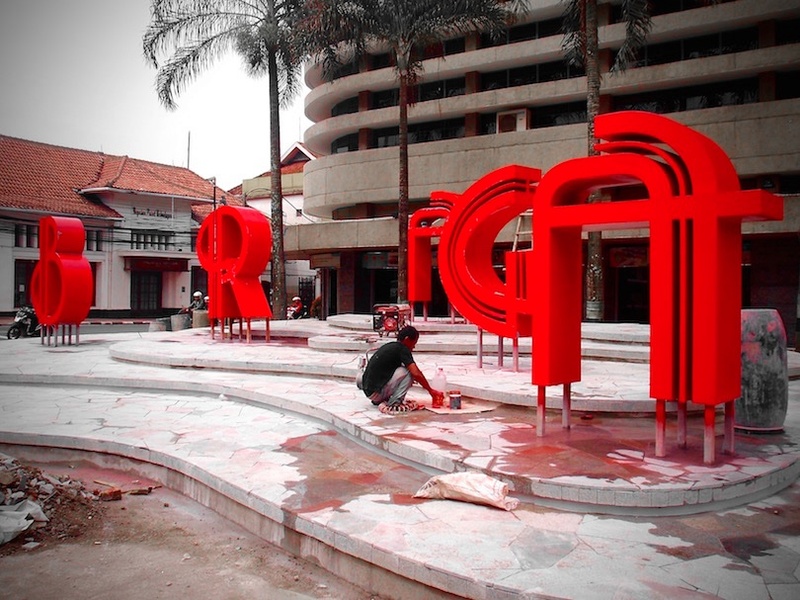 New street signage being installed, Braga Street, Bandung. West Java. On my recent visit, the city was busily sprucing itself up for the upcoming Asia Africa Conference. The original conference took place in 1955, a time to discuss the cold war and the ending of colonialism across developing nations. This upcoming conference in April 2015, will see many world leaders congregate here once more. Navigating my way around the broken footpaths and piles of ready to be laid pavers, I entered Sumber Hidangan, a local Dutch style bakery that first opened its doors in 1929, and hasn’t changed since. This easy time travel seemed to have no physical effects, I didn’t go through any gravitational vortexes or worm holes as in a science fiction film, all I had to do was cross the threshold. But time travel it was. This was the antithesis of mass market production. Light filtered through into the dimly lit space. The dusty wooden floorboards creaked as I entered the high ceilinged store. Peeling paintwork barely clung to the walls. Custom built glass cabinets, also with a layer of dust, displayed trays of fluffy white bread. Glass jars stacked artfully with traditional Dutch biscuits. Signage advertising the wares were in both Dutch and English. The ‘antique’ scales; a cash register and oven that have not been replaced since its opening. Even the staff were ancient. 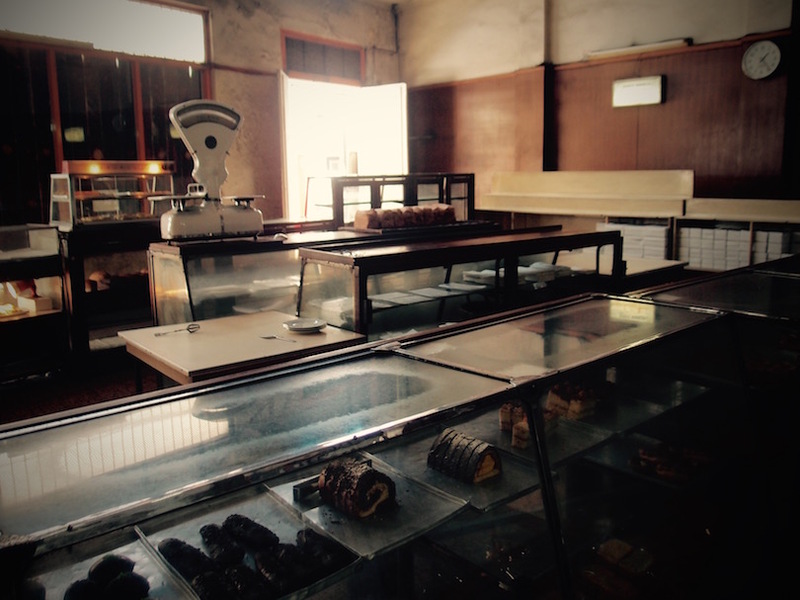 Sumber Hidangan, old Dutch style bakery. Bandung, Indonesia. Fresh hand sliced bread, ready for sale. Traditional Dutch style biscuits in glass display jars, Sumber Hidangan, Bandung. 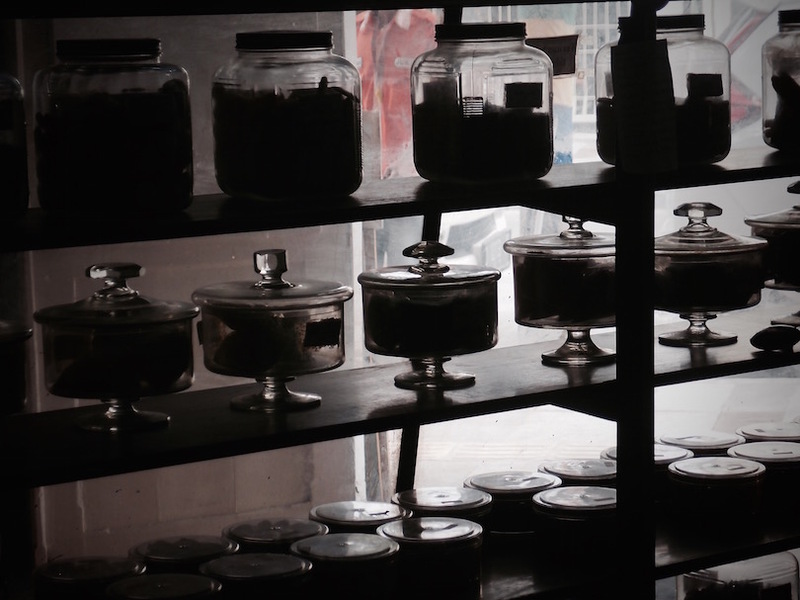 The smell of freshly baked bread teased me, and the glass jars filled neatly with treats caused my eyes to widen. But I was here to show my group my favourite thing about this store – the bread slicer. I approached the counter. To my dismay, the group of ladies in their starched pink aprons informed me that she had gone home for the day. Yes, the bread slicer is a person, no modern technology here. I had been here before when they were quite busy, with several bread slicers skilfully dividing the fluffy fresh loaves into precise slices. My disappointment must have been visible – the friendly ladies proposed if I buy a loaf, they could slice it for me. As I was keen to show my group, I agreed. They only had one variety of bread left this late in the afternoon, the Continental Milk Bread – made with eggs and full cream milk, the sign read. 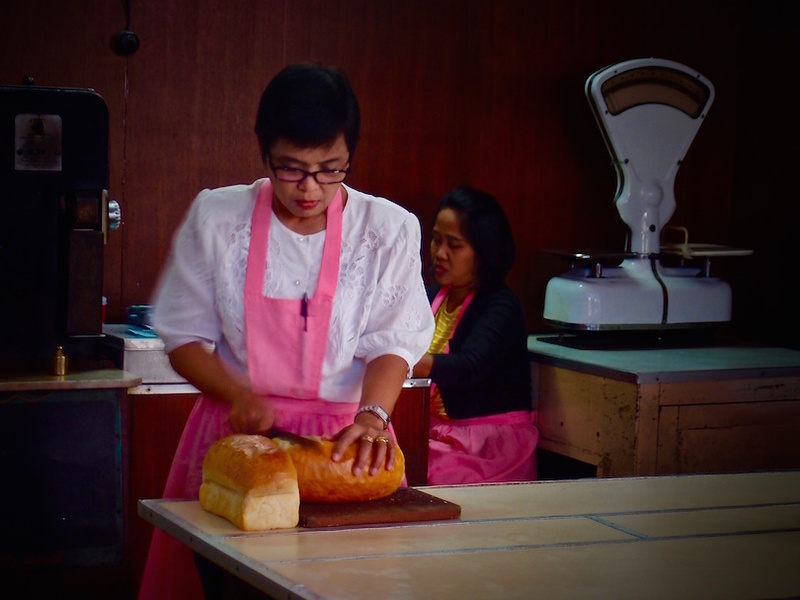 A loaf was selected, and one of the uniformed ladies began to masterly and evenly slice away. Perfect, with just a fraction of a millimetre left intact to hold the loaf together. She then suggested that I didn’t really need to buy it, that they could place it on the shelf with the others on display. They had gone to the trouble of slicing it for me, and it looked fresh and velvety. The ingredients printed on the sign suggested it had few preservatives, unlike the local commercial breads. I would like to try. 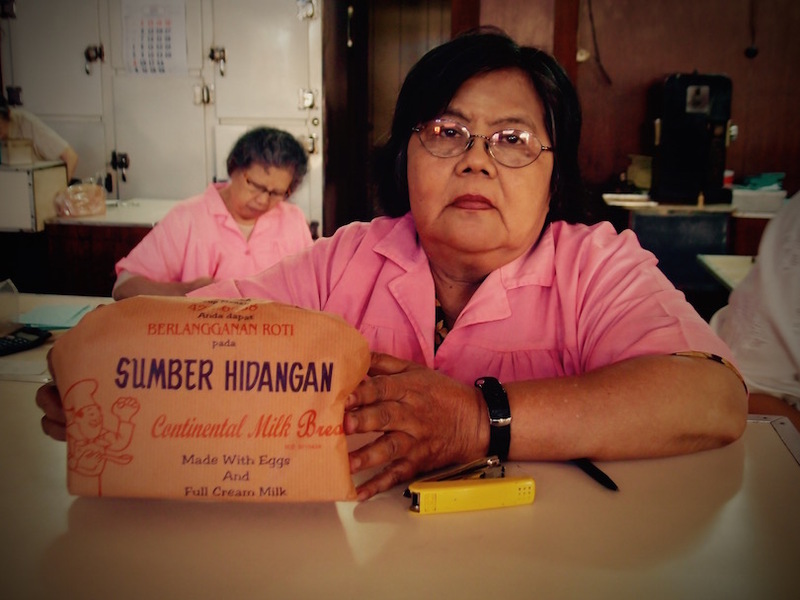 She then briskly wrapped the loaf in brown paper while another woman neatly hand-wrote out my receipt for 10,500 Rupiah (approximately 80 US cents). This was in turn handed to the cashier seated behind a metal security cage. After our transaction, my group bought a few of the pastries, then we returned through the wormhole to the bustling modern street outside. 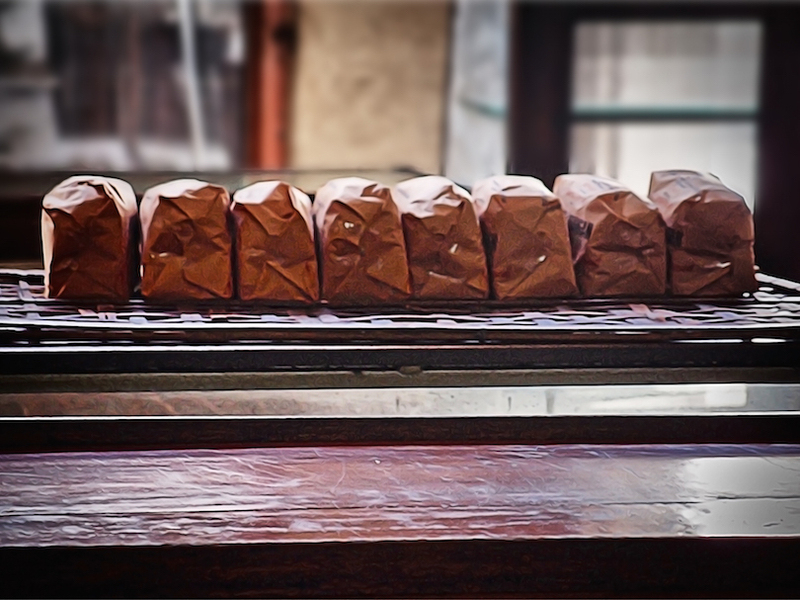 The bread slicer, Sumber Hidangan Bakery. Bandung, Indonesia. Sumber Hidangan is located at 20-22 Jalan Braga, Bandung. West Java. Indonesia.